At JourneyCare, we understand that it can be helpful to talk about the loss of a loved one and the adjustments that follow after your loss. That is why our services include grief and bereavement support for your family. These services are offered for 13 months after the loss of your loved one. While there are no simple answers, our experienced, licensed counselors can help you discover healthy ways of dealing with your feelings and provide support after the death of your loved one. JourneyCare’s team can offer you emotional support and grief education in a setting that is most comfortable for you, whether that be one-on-one or in group sessions. We are with you every step of the way. 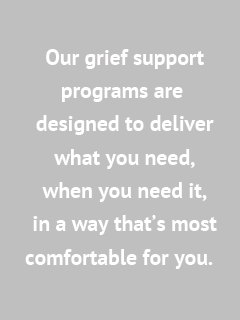 To schedule a free grief assessment for yourself, please call JourneyCare’s Family Support Services at 224-770-2273 or griefsupport@journeycare.org.